An editor at a magazine once asked me to do a calendar on what there is to appreciate in nature each month in the midwest. I started in May, when the issue was coming out, talking about migrating warblers and wild asparagus. I clicked along through each month--sunflowers for August, sandhill cranes for November--until I hit a wall with February. I chewed my pen tip, looked through field guides, and tried to think of something good to say. Finally I wrote that February was a good time for a trip to Costa Rica. Since then I've learned that there's more to nature in Chicago than plants and animals. There is something worth watching in February: potholes. They're plentiful and easy to spot. And when you find one it can provide an interesting lesson in geology. Most geological formations in northeastern Illinois--the ancient beach ridges, the rivers, Lake Michigan--were formed 10,000 years ago when the glaciers receded. And most geological changes under way right now won't be noticeable for thousands of years. In contrast to aeons-long and hard-to-envision geological occurrences, potholes provide instant gratification. Roads aren't real rock formations, but that doesn't matter--nature doesn't discriminate between rocks placed by God and those laid down by the Illinois Department of Transportation. The same forces at work on a natural sandstone outcrop also operate on the Dan Ryan Expressway. The first thing that happens in the creation of a pothole is that cracks form inside the concrete. This fissure formation may be sped along by the presence of rock salt, which corrodes the calcium in cement, according to Rajenera Shah, an engineer at IDOT's Bureau of Design. "Salt is a bad enemy for concrete," he says. But even rain is an enemy. It has carbonic acid in it, and given enough time, the acid can weaken even tough rocks. Ray Wiggers, a geologist and naturalist who wrote Geology Underfoot in Illinois, says, "In geology it's usually not just one process at work but several." In a process Wiggers calls "frost wedging," rain collects inside a crack in a road surface. When the temperature drops, the water turns into ice. Ice, a solid, takes up more room than water, so it squeezes against the concrete. This process goes on for years, through many seasons of freezing and thawing. Up to this point, these actions all fall under the general category of "weathering," a term used by geologists to describe how solid rock disintegrates into loose material. Rain, snow, ice, and strong winds all wear down rocks over time. Yet in the case of a highway, there's a force beyond weather to be reckoned with. While frost is shoving the cement up from below, cars and trucks are pressing down on it from above. Pushed from below, squeezed from within, and crunched from above, the concrete yields. It crumbles into chunks and dust. The best time to observe pothole formation is on a warm day that has been preceded by a cold night. Overnight the ground freezes, and the cement bulges. By late morning the ice turns back into water, which takes up less room--and the concrete collapses into the structures we know as potholes. All around the city during the transition from winter to spring, sections of roadway that have endured years of weathering finally reach this climactic breaking point. Everything happening inside that concrete for so long--and so invisibly--suddenly becomes absolutely apparent. Potholes spring into existence like mushrooms after a rain. Geologically speaking, it's a glorious moment. 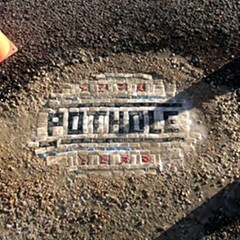 Artist Jim Bachor repairs Chicago potholes with mosaic murals.